PHOENIX (AP) Batting for the eighth time in the game – and facing a catcher he later called the best position player he’s ever seen pitch – Wil Myers got something he liked and hammered it. Myers homered for the fourth time in two days, connecting in the 16th inning off Arizona Diamondbacks backstop Jeff Mathis to send the San Diego Padres to a 4-3 victory Sunday. Myers, who hit three home runs Saturday, clubbed a 3-2 pitch from Mathis (0-1) over the right-field fence with two outs. Mathis was making his first pitching appearance since 2012 and the third of his career. He moved to the mound after catching 15 innings. Mathis threw fastballs and changeups. When the Diamondbacks ran out of relievers and available starters, he was chosen because of his familiarity with the distance between the pitching rubber and home plate. The game was the longest of the season for Arizona in terms of innings, and tied for the second-longest in club history. ”It is a war of attrition out there, and we had a little bit more arm out there than they did,” manager Andy Green said. In his 400th career start – only three other active pitchers have reached that milestone – Greinke lasted just 4 1/3 innings, the shortest outing of the season for the Diamondbacks ace. Austin Hedges singled in the fourth to tie the game at 2 after Greinke got the first two outs. Padres starter Clayton Richard struggled through five innings, allowing three runs and five hits. He walked four, twice hit Jon Jay with a pitch, and also threw a wild pitch. The Padres tied it at 3 on pinch-hitter Jose Pirela’s two-out single in the sixth to drive in Margot. Diamondbacks first baseman Paul Goldschmidt and starting pitcher Patrick Corbin made the NL All-Star team. Goldschmidt was chosen for the sixth consecutive year and set a club record for most selections. Hand was San Diego’s lone representative. 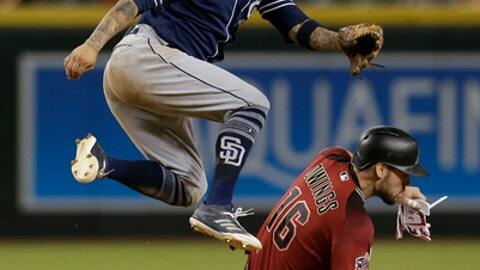 Padres: Return home to start a four-game series with the Los Angeles Dodgers. RHP Luis Perdomo (1-2) pitches Monday’s opener.